Improve schools. Protect roads and water. And make state government more transparent and less partisan. Michigan residents have spoken and, yet again, are pleading with state leaders to focus on the basics: Better schools. Reliable infrastructure. Clean water. And lawmakers who, at long last, are willing to put the people before political party. Those were the most common themes struck by residents across the political spectrum during the Center for Michigan’s 2018 Truth Tour. It’s a simple goal in theory ‒ listen to what Michigan residents want from our elected leaders, then tell Lansing what the people said. The goal may be simple, but the undertaking was audacious. In 2018, the Center for Michigan’s public engagement team heard from 23,000 residents ‒ in person and online ‒ in its journey across Michigan, from Paw Paw to St. Ignace to Southfield. Our team, accompanied by Bridge Magazine journalists, held 176 events across the state. We met Michiganders at farmers markets, documentary screenings, lecture halls, community conversations, and more. This chorus of thousands has melded into the Center for Michigan’s seventh Citizens Agenda, publically released today: Michigan’s Moment of Truth: What Michigan residents want now from elected leaders. To promote these citizen priorities, the Truth Tour hit the road one final time for perhaps its most important journey. The team drove straight to Lansing this morning to personally deliver the report to every legislator as well as to the offices of governor, secretary of state and attorney general, ensuring your message is heard directly. The most popular priority was fixing hyper partisanship. Many indicated they thought it a necessary first step in solving any of the other thorny issues facing Michigan. “Model bipartisan cooperation, inclusion, civility. [Show an] actual concern for solutions that make a difference,” one participant urged Lansing. Residents also said they want solutions that address sliding K-12 performance and limited access to trade schools, with 77 percent of participants citing it as a top priority for the legislature. They implored the legislature to reform state transparency laws, with Michigan ranked by the Center for Public Integrity as the least transparent state government nationwide. Popular ideas to address this issue included campaign finance reform, and expanding the state’s public records laws to include the Legislature and the governor’s office. On the positive side, an overwhelming number of participants reported they think Michigan provides a high quality of life and most residents have shared values which can be used to move the state forward. Many thought infrastructure and water were two issues ripe for bipartisan cooperation. For an in depth examination of the findings, you can access the entire report on Bridge’s website. 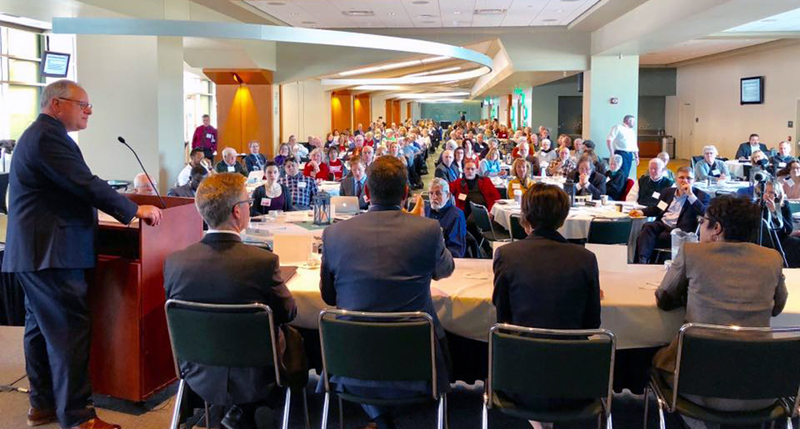 The Michigan Truth Tour was the seventh in the Center for Michigan’s statewide Community Conversation series. Past campaigns have addressed trust in government, workforce development, education, and election priorities. Over 60,000 residents from every corner of Michigan have taken part in these campaigns. These statewide meetings are more than just talk. Citizens Agendas formed from these conversations have played a role in action in the Michigan Legislature. These achievements include the largest investment increase in preschool nationwide, lengthening the public school calendar, cutting corrections spending, and increasing Pure Michigan spending. Copies of the “Michigan’s Moment of Truth” report are available for download on our website. To receive a hard copy, email your name, mailing address, and how many copies you wish to receive to our public engagement director Allie Schmidt at aschmidt@thecenterformichigan.net. You forget it was the republicans that Screw up our schools ( educated people do not vote republicans) Our roads No bid contracts to Carlo by Engler and that closet republican Jeneffer grandMold! And thanks to Snyder taxing the retired and the disable veteranst they left the state taking with them their money!!! Well done. Now let's hope the bozos with a lockhold on the legislature sit up and take notice. Interesting and informative read. Also sad to think that The Bridge continues to accept funding from the DeVos Family's Amway. The DeVos family has fought almost everything in this report and will continue to do so with their billions (yes, folks, BILLIONS). Earned by getting people to buy into a scam. Doubtful this will make it past the moderator's fears. My question to the Bridge is WHY? If you want to appear non partisan why take money from sources that work against what you're trying to do? When will you stop taking it? Speaking of partisanship, In Risk's world you're not allowed to have opinions and be willing to to promote them unless you are a leftist and or an insignificant nonentity as is he. Any charitable good you've provided to your community is only of value when seen through your political beliefs. How much money do you give away Rick? "The most popular priority was fixing hyper partisanship. Many indicated they thought it a necessary first step in solving any of the other thorny issues facing Michigan." OK ... How about we remove all party designation on the ballot? Who cares what party your drain commissioner or University Regent is? Somehow since the Democratic party won't even abide elimination of straight ticket voting, this wailing about partisanship is empty posturing. Maybe because a drain commissioner belonging to a party that doesn't believe in having or enforcing regulations is a bad choice? If the lame duck made nothing else clear, it did one thing: the legislature in this state could not care less what the people think. Take all the money out of politics. I hope you are okay with that Betsy DeVos. No more dark money. Re-do the Supreme Court decision to keep names out and unlimited money in. Make education a priority and fix infrastructure roads etc. Also fix auto insurance high rates with only catastrophic in the states. Make education of only public schools a priority. Take all the money out of politics. Oh, sorry about that Betsy DeVos Money should not buy elections. Rescind the Supreme Court decisions giving unlimited funds with no names attached or also known as dark money. Fix our infrastructure roads and lower insurance rates fix catastrophic insurance with Mi. being only state to offer. Plus with no transparency of these funds.